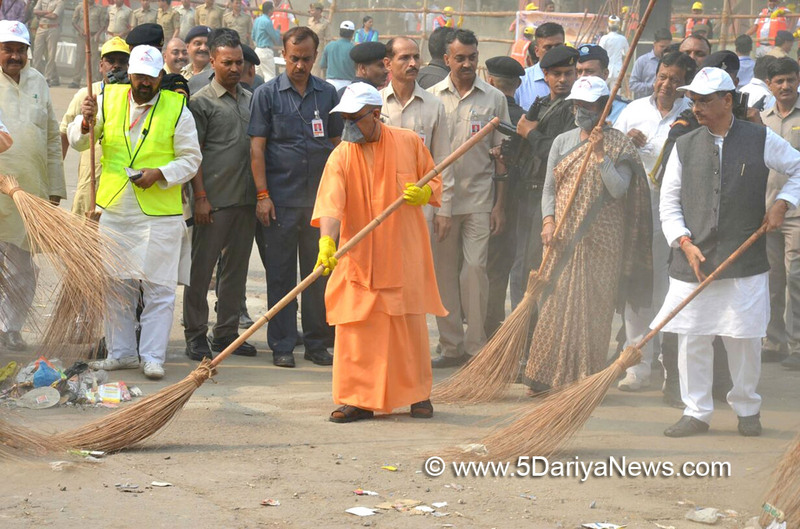 Uttar Pradesh Chief Minister Yogi Adityanath on Thursday visited the Taj Mahal and wielded a broom to launch the 'swacchta abhiyaan' (cleanliness drive) at the western gate of the monument. He spent about 30 minutes there.As he arrived amid tight security, BJP activists shouted slogans hailing him as well as 'Jai Shri Ram'. Adityanath is set to unveil a Rs 150 crore package during his day's visit to the Taj city, which he last visited on May 7.The visit comes in the backdrop of statements by BJP leaders saying the 17th century Mughal-built Taj was a blot on Indian culture and history. The statements triggered a backlash from many quarters, forcing the Bharatya Janata Party to distance itself from the comments. Later, the Chief Minister announced he would visit the Taj Mahal and said the monument had been built by the sweat and blood of Indian labourers.Municipal corporation polls are likely to be announced soon and the BJP government in the state is trying to ensure that there is no hostility for the ruling party before or during the electoral process.Journalists who went to cover Adityanath's visit had to go through a lot of trouble as their cars and OB vans were stopped far from the venue of engagements.Some journalists rang up senior government officials to protest but to no avail. The chaos, journalists said, prevailed for more than an hour.